While the regular Android operating system has been transitioning from Holo’s black themes to Material Design’s white themes, Wear OS has been going in the opposite direction. The platform has gone from a theme with mostly white backgrounds to one that is either completely black or is paired with darker accent colors. This is likely due to the battery life improvements that are so heavily needed on a smartwatch and has been a welcomed change. 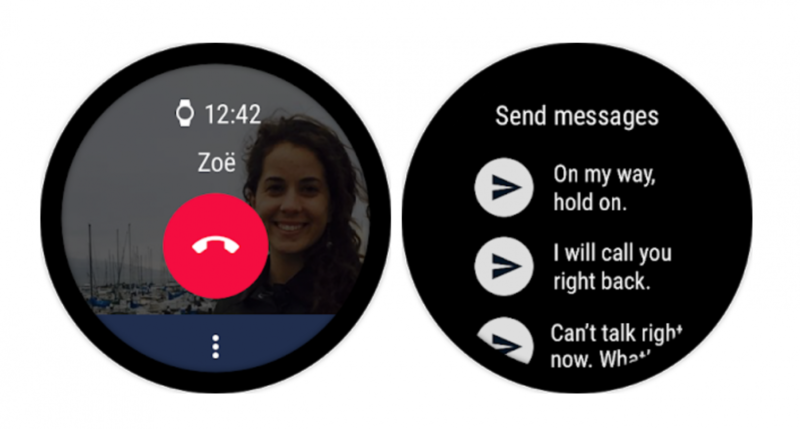 Google has just now updated their Wear OS phone application and with it comes the new dark theme along with the ability to send quick replies via SMS. The Wear OS platform has gone through so many changes since its inception that many people are left wondering if even Google knows what direction it’s headed. The Android Wear 2.0 update removed a lot of features that many had grown to rely on with their smartwatch. For example, before the big 2.0 update, you were able to reject a phone call from your smartwatch while also sending a quick reply to the person who was calling you. This was removed with Android Wear 2.0 but is now available in Wear OS with this new update to the companion phone application. So along with bringing this quick reply SMS feature to Wear OS, it is also receiving the black theme that was mentioned earlier. The new interface update for the phone application also opens up to a vertical scrolling list of features. This begins with your call history page, but also includes a dialer icon at the top to let you manually dial a phone number if you’d like. After scrolling past the call history page you are then greeted with your contacts list which allows you to start a phone call with a simple tap.